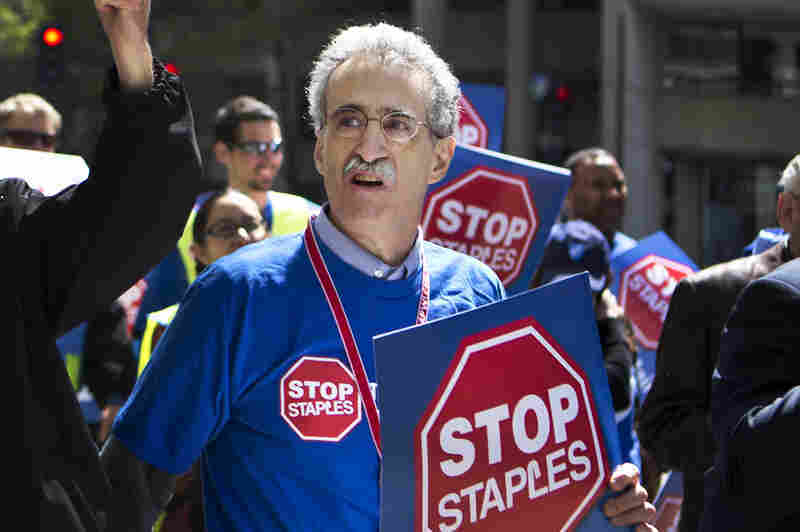 Postal Workers Protest At Staples Over Shift In Jobs U.S. Postal Service workers picketed in front of Staples stores on Thursday. They were protesting USPS plans to provide mail services inside Staples stores, using nonunion Staples employees. Postal workers take part in a march in Washington, D.C., on Thursday to protest the opening of U.S. Postal Service counters at Staples stores. U.S. postal workers took to the streets Thursday to protest in front of Staples office supply stores around the country. At issue is a decision to open Postal Service counters in Staples stores — something they say is siphoning away union jobs. The postal workers' grievances come as their employer faces pressures to find new avenues of business. Both the American Postal Workers Union and the leadership of the U.S. Postal Service lay claim to be fighting for the same cause: safeguarding the long-term future of one of the largest employers in the country. 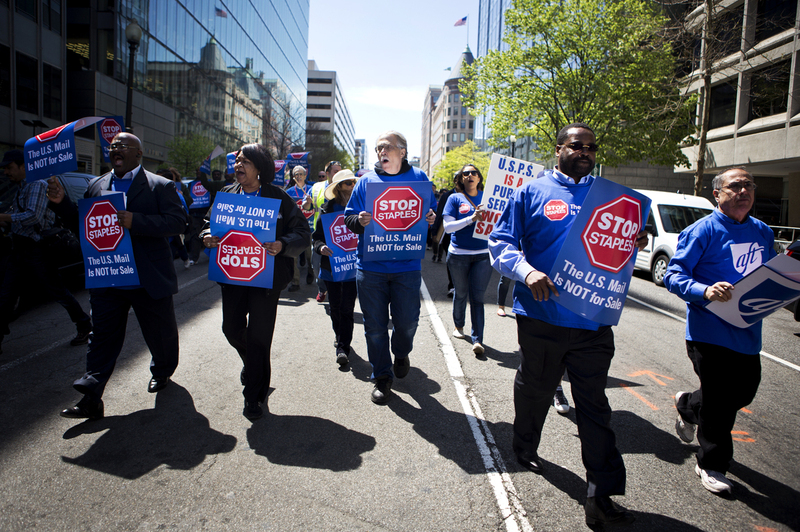 "Eventually these [kinds of] deals are going to shift living wage jobs in the postal system to non-living wage jobs in the retail sector," says Mark Dimondstein, president of the American Postal Workers Union, seen participating in Thursday's protest in Washington. The sharp disagreement comes over how to go about it. Speaking at a protest in Washington, D.C., postal union President Mark Dimondstein says it's fine that the Postal Service wants to open counters in retail outlets, as it began to last year in Staples stores. The problem, he says, are the terms. "Our demand on the question of the USPS-Staples deal was to put postal employees in those postal units," Dimondstein says. Instead, the counters are staffed by Staples employees. And the Postal Service has made clear it hopes to keep expanding within the Staples chain and with other similar partners. "Eventually these [kinds of] deals are going to shift living wage jobs in the postal system to non-living wage jobs in the retail sector," Dimondstein says. He says consumers will suffer, too, because postal employees receive better training and offer better service. "The people of this country deserve to have their postal services performed by well-trained, uniformed postal workers accountable to the people of this country to protect the sanctity, security and privacy of their mail," Dimondstein says. How does he respond to customers who complain about long lines and surly service at the post office? "That's on postal management, not on the postal workers," Dimondstein says. "And we agree that post offices should be staffed better. We're not happy about that either." The Postal Service is in a financial bind, because for years it has run deeply in the red. To a large degree, that is because a congressional mandate requires the agency to pre-fund its retirement benefits many decades in advance. But Postmaster General Patrick Donahoe also notes that first-class-mail volume — the service's bread and butter — is in sharp decline. And, in a video response posted this week, he defended these retail partnerships, saying it would help expand postal business, increase revenues and preserve postal employees' jobs. "It gives customers more choices on where and when they can purchase postal products and services and help secure the long-term future of the Postal Service," Donahoe says. About 100 union supporters registered their dismay in Washington, D.C., carrying signs and stopping lunchtime traffic. Rich Shelley drives a truck for the Postal Service and works in Baltimore. He says the morale at his job has changed dramatically in the 17 years he's worked at the Postal Service. Now, he says, management cares more about the bottom line than delivering good service and instilling pride in its workers. "The main thing is postal workers take an oath of office," Shelley says. "They're accountable to the American people, they're well trained in postal regulations — and Staples workers are not." He took to the streets Thursday, he says, because he wants postal work to be around for a long time to come.